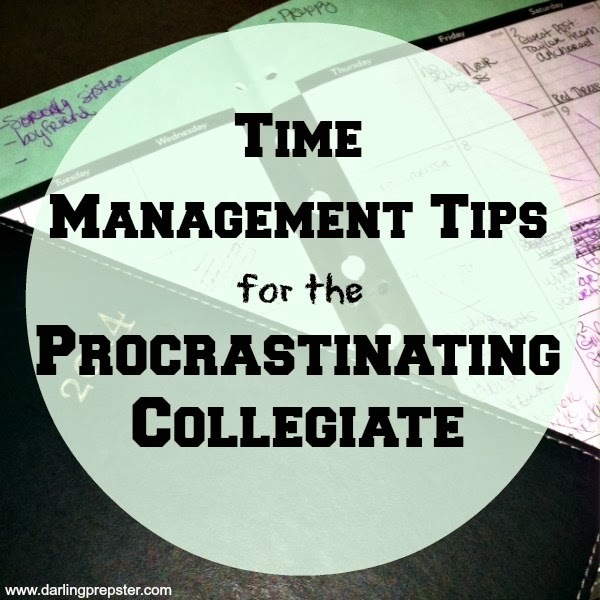 Recently, a lovely reader emailed me asking for tips on time management in college. First I chuckled because all of my friends know me to be a procrastinator, however, I also get work done. Personally, I believe how we manage our time is going to differ from person to person. What works for me, might not work for you. I'm definitely not Type A and I don't have OCD tendencies. Last semester I took 21 credit hours, had an internship, and also kept this blog here up to date. This semester, I'm a bit overwhelmed with 24 credit hours, 2 part-time jobs, and also, this blog which I see as another part-time job, more on that in a future post. Obviously, I'm a busy person so I figured I would share a few of my time management tips, from a procrastinator for a procrastinator. 1. Use a planner! I keep track of every single homework assignment, sorority event, service project...everything! I utilize the space for each day in the planner and write out what needs to be done that day and the times for it. Seriously, anything I need to do that day I write down - workout time, dinner time, classes, time for homework, breaks, even sleep! I also keep a separate monthly calendar to organize my blog posts for the month! 2. Schedule time for yourself! Fridays after 6 pm until Sunday at noon are my time. This might make me sound like an awful student, but I refuse to do homework during this time. I do enough of that during the week. I use this time to do other work such as writing posts, painting for my Etsy shop, laundry, and cleaning my bedroom. 3. Prioritize! Everyone's priorities are different so I'm not going to tell you homework needs to come first. I have a very unique perspective when it comes to my G.P.A. and personally, I could care less what that number is as long as I get thatfancy piece of paper diploma in May. While I do my best to keep my grades up, with as many credit hours I am taking this semester, I definitely prioritize which ones I'll dedicate more time to than others. If you have the means and time to get a perfect 4.0, all power to you. 4. Keep your professors informed! If you have a crazy schedule and course load, make sure to inform your professors and keep them up-to-date, especially since you might be turning in assignments late. Hey, it happens. It's not going to be the end of the world. I am deadline-oriented...if I'm passionate about the work. Ok, so I'm probably not the best role model when it comes to grades and I hope you don't take this post as unappreciative of my education. My education means the world to me. I wouldn't be paying for it if I didn't find it to be important. I value my education, but I also value real world experience and financial stability. Moral of the post, figure out what works best for you when it comes to time management! We all have different priorities and different amounts of time we can dedicate to classes, projects, etc. What's your best time management advice? Procrastination and time management are two such interrelated terms that if they are not defined or taken care of properly, definitely they will have a distraction with a long term arrangement. And when the talk comes for the collegiates, then there is no doubt that the time has to be utilized in a proper format with respect to the work culture to go ahead with. I was a collegiate when the usage of tools came across my lifestyle and the hours tracker literally gives a kick start to my career which boosts up my lifestyle.